In the substantial programme book for WNO’s Spring 2019 season, the section on Un ballo in maschera contains (among other things) a piece by Alan Swanson on Gustav III’s fascination with the theatre and theatricality (relevant, even though it was the version set in colonial Boston that we were to see), and an essay by director David Pountney which begins with the confident assertion that ‘Verdi’s Un ballo in maschera is a prominent example of the fascination for the Gothick that ran through 19th-century literature and the visual arts’. It comes, therefore, as no surprise that theatricality and the Gothic are determining presences in this production. The theatricality is evident in, for example, the way in which Riccardo is characterised, as a man who behaves as if he knows that he is an operatic tenor – the book that he carries and consults through much of the opera might be a miniature score or perhaps a set of director’s notes. Certainly, he regards all that happens as scripted, and as controlled by him. His Boston is full of ‘plots’ (the pun is intended), of disguises and deceptions. Gothic trappings abound throughout – some of them fairly directly prompted by the libretto (such as the witch/prophetess Ulrica and her rituals, though her recurrent presence in scenes in which the libretti doesn’t mention her is a directorial decision, so that she is deployed in much the same way as Pountney used Preziosilla in his production, last year, of La forza del destino). Other ‘gothic’ events have no source in the libretto. One such is the splendid coup de théâtre with which the production opens. David Pountney put before us something very different – and very striking. On stage was what initially looked like a monumental tomb, with a sculptural recumbent figure atop of it. That figure turned out, as we later realized, to be no sculpture but the very much alive Oscar, Riccardo’s page, conceived of as not so much steampunk, as Enlightenment-punk. Another figure, later identifiable as Ulrica, was seated near the ‘monument’. Part of the ‘monument’, it become clear, was actually a coffin; in a curtained area beneath it were huddled a clutch of sunglass-wearing Mafiosi (or so it seems) – who one assumed, if one knew the opera’s plot, to be those conspiring against Riccardo. A hand appears from within the coffin and waves – the moment is more comic than ‘horrid’. It is followed by Riccardo emerging from the coffin – in a kind of mock resurrection. He proceeds directly to the gubernatorial business of the day, as if this ‘resurrection’ was a normal beginning to his ‘working’ day – though typically the chief business seems to relate to plans for a masked ball. Elsewhere the Gothic takes over most spectacularly in the closing masked ball, which seems to involve a kind of fusion of Halloween, the Mexican Day of the Dead and Walpurgisnacht. In the last scene of the opera, the theatre’s (large) stage is packed with figures in robes decorated with skeletons. These fancy-dress skeletons (my grandchildren wear something similar at Halloween) add to the way in which so much in this production (and, indeed, in the opera itself) seems to balance, just about, on the knife-edge between farce and tragedy, perhaps one could say in the territory occupied by (very) dark humour. I confess that at times I didn’t feel sure whether Pountney sought such a precarious balance, or whether there was a simpler, parodic intention at work. Since I don’t think that parody was in the mind of either Verdi or his librettist (Antonio Somma), and since Pountney’s admiration of Verdi has always been very evident (in the programme he writes that ‘Verdi composed the drama of melody, melodrama, contrast. Wagner that of ideas and transformation. Both were giants.’) it seems unlikely that we should read the production as parodic, even when some of Verdi’s more simply rollicking music prompts some dancing that reminds one of a dated production of Ruddigore. I presume, rather, that Pountney’s concern is with a sense of the grotesque – an element which certainly plays an important part in this thought-provoking production. Whatever uncertainties there may be as regards tone, what is very clear is that in visual terms the production is memorable, with its sets designed by Raimund Bauer, costumes by Marie-Jeanne Lecca and the lighting designed by Fabrice Kebour. And, above all, this was in practically every respect, very impressive as a musical performance. Carlo Rizzi’s conducting – as it seems always to be in Italian opera – was excellent, and the orchestral sound was thoroughly idiomatic. The WNO Chorus was outstanding – when is it ever anything else? – and their contribution alone would have been enough to show anyone who didn’t know it already, that Un ballo in maschera contains lots of tremendous music. The principals were of a high standard, too. None more so than soprano Mary Elizabeth Williams as Amelia. She has been a much-appreciated regular with WNO for a few years now and it has been a joy ands a privilege to see her fulfilling so completely the promise that was already evident in her early appearances in Cardiff. She is now a very fine singing actress (her acting has improved greatly). She treated us to some very moving singing, especially in her scenes with Renato, most particularly when pleading, as she expects to be killed, to be allowed to see her son for a last time, as well as considerable vocal power (in her ‘love’ scenes with Riccardo). I have sometimes had my doubts about Gwyn Hughes Jones. Even last year I wrote of him, in a review of Pountney’s production of La forza del destino, that ‘his acting leaves a good deal to be desired. In that regard he paints with a very broad brush’. That remains largely true, but I was more convinced by him on this occasion. This was as good a performance as I have seen/heard from him. While he is still not the greatest of actors, he is, on this evidence, better able to bring a character to plausible and coherent life, and he was on good form vocally, shaping melodic lines more sensitively than he sometimes has in the past. Roland Wood’s Renato was well sung, and one was wholly convinced of Renato’s stolidly limited sense of the virtuous. Sara Fulgoni’s Ulrica, while at times a little underpowered vocally, was an appropriately disturbing presence, as a kind of active embodiment of ‘Fate’. Relatively minor figures such as the conspirators-in-chief, Samuel (Jihoon Kim) and Tom (Tristan Hambleton) were well-sung, though the opera (and the manner of production) did not allow them to develop beyond caricature into character. 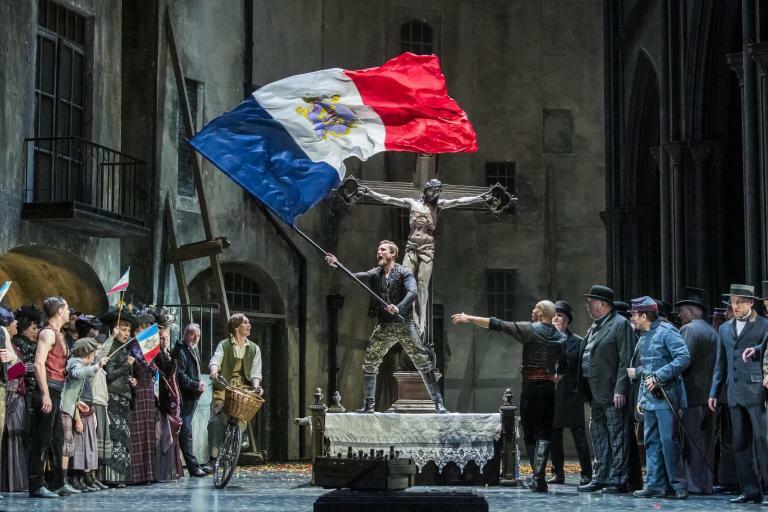 An engaging surprise – both because the page Oscar is not normally a character of whom one takes much notice in performances of this opera and because the singer taking the part, Julie Martin du Theil was new to me – was the role of Oscar. This Oscar was an antic leather-clad spirit of (largely, but not only) playful mischief, obviously devoted to Riccardo – and clearly a fitting servant/partner for him. At times, indeed, Oscar was effectively an ‘extension’ of Riccardo. Martin du Theil was a spirited and energetic performer and she clearly possesses an attractive and agile voice. It is to be hoped that we see and hear more of her. Having begun the evening with one coup de théâtre, David Pountney closed it with another, though perhaps less successfully. The play-acting Riccardo, so fond of deceiving others and unable to take anything altogether seriously, contrived to avoid being assassinated. In the confusion of the fancy-dress ball (it was that rather than a masked ball, strictly speaking) Oscar describes to Renato, now the assassin-in-chief, how the king (sorry, the governor) is dressed. But his description is actually and purposefully of one of the attendants, rather than Riccardo. It is that anonymous attendant who is stabbed, not Riccardo, who watches, still clutching his book, from one side of the stage. Although there is a neat symmetry to this (Riccardo’s ‘death’ at the end is as unreal as his ‘resurrection’ at the beginning), which is of course quite different from what happens in the libretto, and it seems in line with the way Riccardo has been characterized throughout the production; but it makes considerably less dramatic impact than the ‘real’ ending does. Yet, Verdi’s stirring music carries one past this rather doubtful moment, which comes perilously close to a kind of condescending rewriting. For more about WNO’s performances click here.